Now we have a GI Joe Kre-O blind-bagged decoder. Wish we'd had that when I found the box of them at Toys Я Us - I would have been able to predict what I was getting before getting home. Hasbro has not given the GI Joe Kreons even the bare minimum of biographical information the Transformers get, but we can imagine what Quick Kick's would be, if he did. He really made no impression in the comics, and his filecard painted him as a generically super-competant; but on the cartoon, he was a stuntman/actor who did impressions all the time. So probably something about that. Quick Kick's costume is decidedly not military standard. He wears black pants, a grey belt with blue pouches on it, and a red sash over his left shoulder that has three shuriken tucked into it. That's it. No shirt, no shoes, no serviceman's emblems... but he does have a Karate Kid headband. The figure has orange paint details to make his chest muscles, but it suggests his barefootedness by simply painting the front of his feet skintone, not the full foot - and the paint is so thin that the paint doesn't match the rest of the body. He's also got a goofy look on his face. 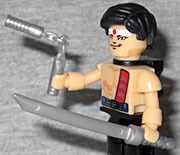 The character's specialty was "silent weapons," and so he came with a sword and nunchucks. 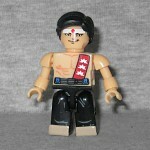 This Kreon comes with the same things. The nunchucks are made from two pieces that hook together, so they can actually move. The sword fits into the included backpack, in any of three directions. Frozen Fudgees, what a treat! Lots of chocolate, really sweet! "And turn to lead in your guts." The sticker is a little too thin, though, so if you apply it directly to the brick, the detail will disappear. We recommend cutting out a small piece of the white backing from behind the sticker, and putting that between the decal and the block. It helps. A lot. That time that "Yo Adrian" almost met "Yo Joe!"